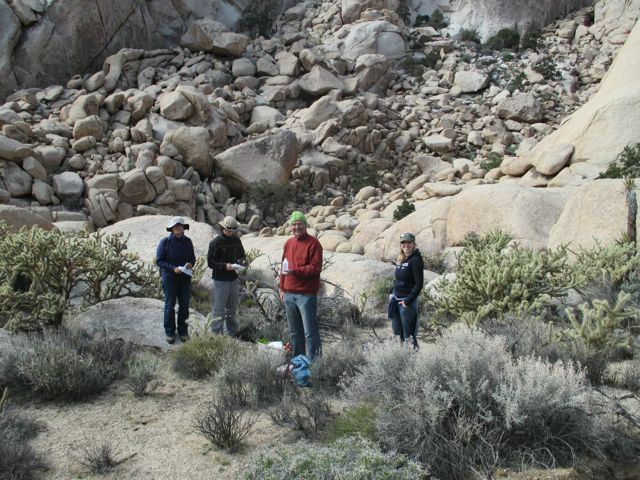 The Sweeney Granite Mountains Desert Research Center supports research in a wide array of disciplines through providing researcher lodging, laboratory space and equipment, logistical support, and protected areas on which to implement research projects. All proposed projects are reviewed by the resident Director to minimize impacts on resources and ensure that project implementation will not affect existing research projects. We currently have over 160 research projects affiliated with the GMDRC, below are some examples. Dr. Chris Lortie, an integrative ecologist in the Biology Department at York University (Toronto, Canada) has supported several students doing research out of the Center. Two of these students, Ally Ruttan and Amanda Liczner, are graduating seniors working on Honours Theses in conjunction with Ph.D. student Alex Filazzola; all are studying indirect and direct effects of nurse-plants in desert ecosystems. In 2015 Ally and Amanda completed their projects by submitting thesis papers, whereas Alex is aiming to complete his dissertation by 2018. Ally’s thesis, titled “Basal plant facilitation extends to insect community structure and diversity in the Mojave Desert, California”, was conducted at the Kelso Dunes on the sand hummocks dominated by creosote bush (Larrea tridentata). The focus for this project was to test the hypothesis that nurse-plant effects are not limited to other plants, but rather these effects can extend to other trophic levels such as the insect community. The results of this study support a positive relationship between nurse-plant microsites and insect abundance, richness, evenness, diversity, and composition. In addition, they found certain insect families (Sphecidae, Formicidae, Bradynobaenidae, and Lauxaniidae) to be more closely associated with the shrub islands (nurse-plants), versus Scarabaeidae was associated with open sites. Interestingly, they used several iPod Touch devices to record insect activity at the microsites; each unit was encased in a protective hood and allowed to run constantly for 2-hr intervals during the day. Ally Ruttan is shown in the photo below sweeping for insects. Photo by Amanda Liczner. Amanda Liczner was also studying nurse-plant effects at the same location in the Kelso Dunes, but her project was focused on plant-plant interactions. In her thesis, titled “A desert nurse plant (Larrea tridentata) facilitates the germination and seed characteristics of winter annuals in California,” she presents data supporting the hypothesis that (L. tridentata) nurse-plant effects on seed mass, viability, and germination rates are species specific. Only two of the four annual species tested in her reciprocal germination microclimate growth chamber experiment showed significant differences in seed biology (Chaenactis fremontii and Malacothrix glabrata, but not Aliciella leptomeria and Eriophyllum wallacei). Further, the results from her study do not support the hypothesis that nurse-plants are influencing local adaptation, but rather influencing adaptative germination. We will undoubtedly learn more about these results as they continue to run experiments on the direct and indirect effects of nurse-plants on annual plant and seedbank dynamics. Daniela Klein, a doctoral student at University of Mainz (Germany), along with undergraduate Philipp Hühn and their advisor Dr.Regine Claßen-Bockhoff, are interested in pollinator-driven evolution of floral traits in Salvia subgenus Audibertia. This group of plants provides a unique model system to study the functional significance of the staminal lever mechanism, a morphological trait that has evolved with bee pollination. Most Salvia species are bee-pollinated and therefore have a functional lever mechanism, however, of the 19 species in the Audibertia subgenus, only one taxon (Salvia columbariae) has this trait. In order to learn more about this unique group of Salvia species, Klein, Hühn, and Claßen-Bockhoff arrived at the Center in March of 2014 to conduct pollinator observations in the field, collect morphometric measurements on Salvia flowers, and perform pollen transfer experiments in the field. At the Center, they worked on three species: Salvia columbariae, S. mohavensis, and S. dorrii, however they were also studying species such S. funerea and S. apiana in nearby mountain ranges. Their research objective is to elucidate the mutual adaptations between flowers and pollinators and to understand the evolutionary significance of the staminal lever mechanism. 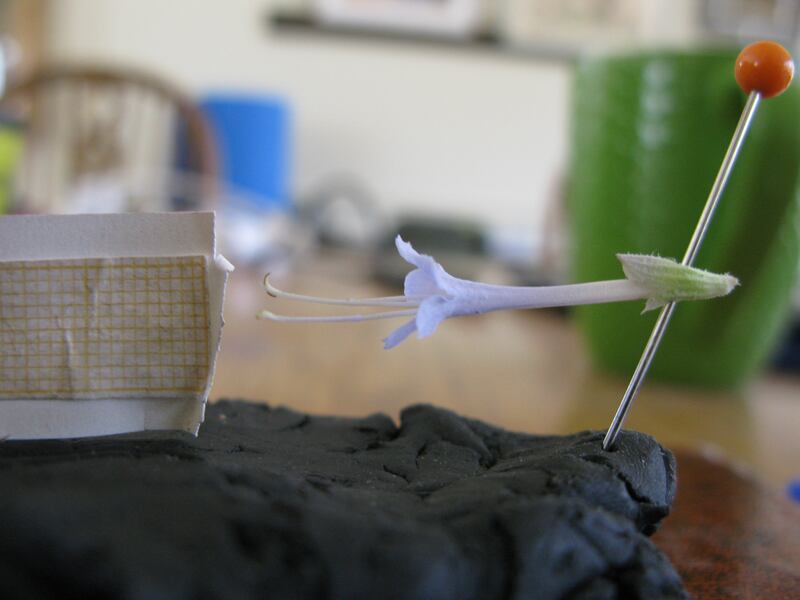 The photo below shows Salvia mohavensis pinned for morphometric measurements at the Allanson Center laboratory. Photo by Daniela Klein.